I always postponed them for one or another reason. Now I realise …. why wait…. I need to make them real! A dream doesn’t become reality through magic, it takes sweat determination and hard work. “The more you can dream, the more you can do”. One person with passion is better than forty people merely . no matter how unattainable others think it is. Have a great dreamy day ! If I had a set of stairs I would love to have that photo painted on them. Really liked this post! Oh that woudl look lovely Terry, and so colourful! Dir auch Andrea, einen schoenen Dienstag! Vielen Dank ! Thank you very much for popping in and commenting. I shall be climbing….yes. I agree with you! Have a beautiful day ! Your dancing dreams seem to be working out well! You are right there! You know as a child I always dreamt to do tap and as an adult I am doing it.A big dream come true! I like those stairs. Sometimes I think we dream too big and give up because they seem impossible. Perhaps start off with the little cap nap dreams and work your way up. 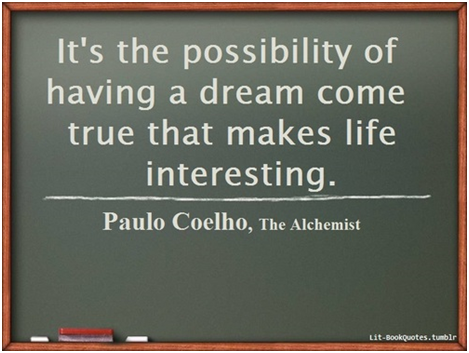 But the important thing….yes is to dream. Yes dreaming is essential, I find. My stairs are painted yellow… I did them, so I could really have mine painted like that with lots of colours too. What a good idea…. I love this!!! Exactly what I needed this morning!!!! Thank you, Sweetie!!! Oh I am glad Skye! Dream on! Thank you so much for your warm comment and for sharing it Arlen. Wishing you a wonderful day. Thanks for this dream-come-true post! It was just what i needed to read, this morning. Fantastic. Have a wonderful day! Let’s hope they become better dreams Alastair! oh no! Palm trees, cocktails and hugs are much better! 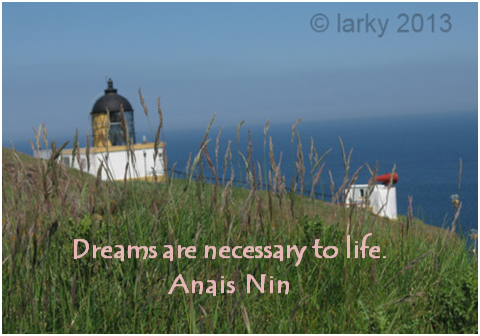 Dreams are the nourishment of life! Wonderfuly said, thank you Fred! Needed this bit of encouragement this morning Ute – thank you! Fantastic, so glad to be of help,and encouragement! Thank you so much Tazein! Much appreciated ! Take care! What beautiful quotes Ute, thank you. So glad you like them Linda, I love having you around ! Love the art on the stairs! I love all these quotes you share! A dream really does stop being a dream once we DO it! indeed! I agree with you, Ute! Thanks for the inspiration today. Lovely post my friend. Thanks Michelle! Glad you lik eit! 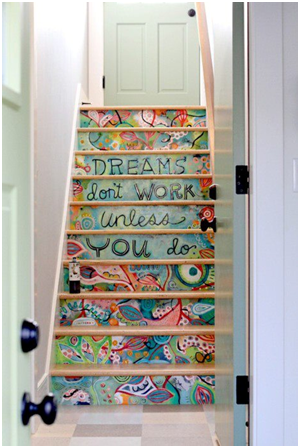 Dreams are so important in life…I think I would just shrivel up without them♥ The stairs are divine! I agree , we need to have greams, keep us going! Thanks! I love the stairs! Sweet post Ute! They are great, I could do mine like that… at the moment they are painted yellow at the moment. Yes I like it bright! 🙂 So I could transform them into colourful stairs really! That is a good idea ! Might just do that, once I finished painting my sons’ bedroom.! Dreams are essential in my opinion Ute however I have met many dreamers who simply don’t take any action to make them happen. Have a dream/s but do something about it! David, I have met them too.. actually I was one of them some time ago and then I realised it is up to me to change that, and I did, well still do! … and I love it! Thanks David! Beautiful post on dreams – radiates peace! I am thinking of doing mine like that…. would look so nice when I get into the frontdoor! They are painted yellow at the moment, I painted them, so it should not be too difficult! Thank you LuAnn, you go and enjoy and do what you and Terry dream about ! Sorry I haven’t been around, so bogged down with research and sure wish I was a faster typist. Reblogged this on GYA today. Life is what happens to you while you’re making other plans. Thank you very much for visiting and commenting. I do need to say though that: live in the moment, now and not let life happen. Enjoy every day to the full.